﻿ Gareth Bale: "Cristiano Ronaldo is the boss and the best player in the World"
03.09.2013 » Gareth Bale: "Cristiano Ronaldo is the boss and the best in the World"
The wait is finally over and this past Sunday Real Madrid officially announced that Gareth Bale had signed a 6-year contract with the club. The transfer fee remains a mistery, with the Spanish press insisting the deal was done by 91 million euros, while most of the international press claims that it was a world record transfer fee of 100 million euros. Gareth Bale has finally become a Real Madrid player this Sunday afternoon, as the club was keen to announce the signing on its official website and in all its social media pages. 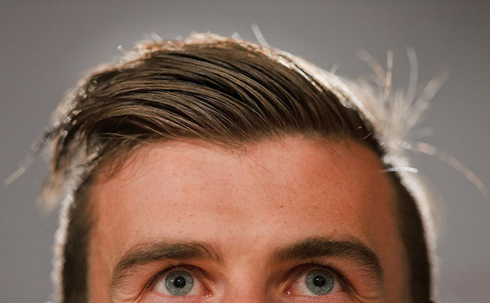 In Madrid, the Welshman and former Tottenham Hotspur star will join Cristiano Ronaldo, precisely the football player from whom he gets most of his inspiration from, as he has already confessed many times in the past. 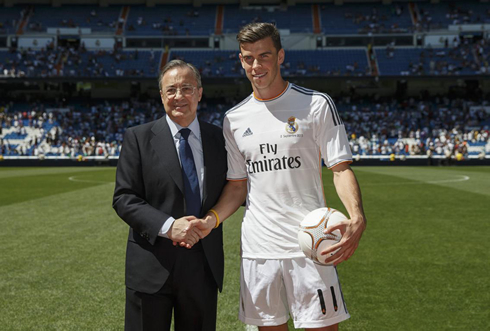 Whether or not	Bale's transfer fee was actually a world-record signing remains unknown, since none of the clubs has yet revealed any official statement in regard to the amount of money that was agreed to be paid. However, Spanish newspapers have been confidently reporting that it all went forward supported on a 91 million euros deal (78 million pounds). At the other side, the English press and pretty much the rest of the world has sticked with a version where Gareth Bale's transfer has actually broke Ronaldo's 96 million euros world-record transfer fee that dates back to 2009, when the Portuguese forward got transferred from Manchester United to Real Madrid, by suggesting that both parties have agreed Bale's deal on a round sum of 100 million euros (85 million pounds to be more precise). This summer's transfer deadline has been crossed by now (the transfer window closed on September 2, 23:00 BST) and there were several pleasant and unpleasant surprises being unwrapped over its last days and hours. We'll won't dwell on anything but Gareth Bale's signing for now, as we'll reserve another news story to analyze how this transfer window ended up playing in terms of what the future may hold for Real Madrid. Journalist question: You have just arrived with a "world-record transfer fee" tag wrapped around your neck. Do you feel any pressure? 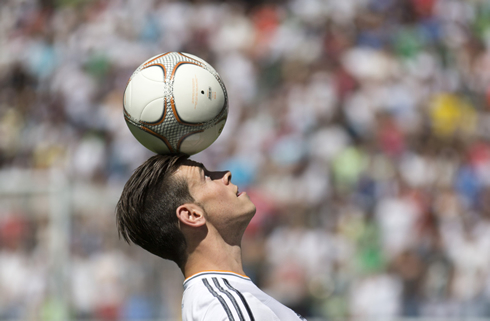 Gareth Bale: "The only pressure I feel is the one I allow to get to me. I want to help the team and the pressure is brought up by myself. I would even say that more than pressure itself, I felt thrilled for signing. It has finally happened and I arrived to the best club. I don't think there could any more pressure than the one I'm already making on myself to help this club winning." Journalist question: Did you thought of giving up at any point and saying something like: I'll keep on playing for Tottenham? 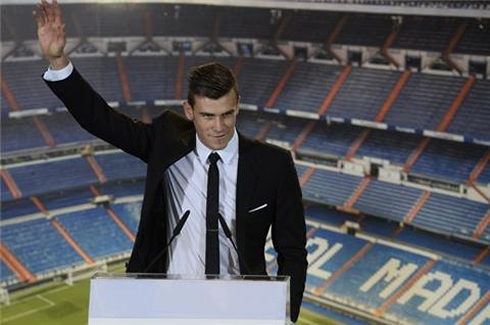 Gareth Bale: "No, as I said this is a dream for me. Florentino Pérez and José Ángel Sánchez have made a great effort in order for me to be here. Since the very beginning I just wanted to make my dream come true." Journalist question: How did things go during the deal negotiations? 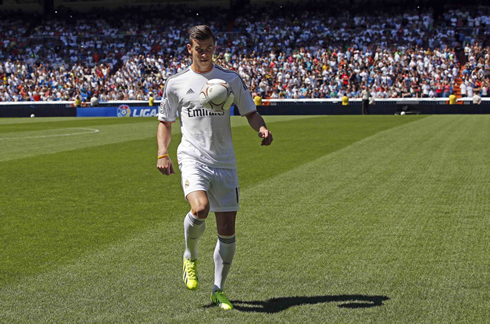 Gareth Bale: "Everything unfolded in a natural way. I spoke with Florentino and I got confident that this moment would arrive. I owe him a lot and now I can't wait to start playing with my new team." Gareth Bale: "I don't have anything to do with those matters. I would have come here even for a single cent or any other amount of money. I want to win titles, the UEFA Champions League and become the best player. The price that was paid has nothing to do with me." Journalist question: What did you feel when you stepped onto the pitch of your new stadium? 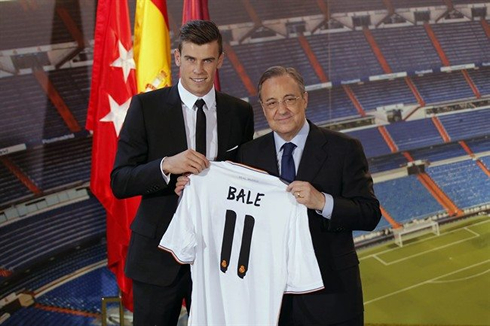 Gareth Bale: "I was very nervous. It's an incredible experience. The opportunity to be in front of so many people and to receive this kind of treatment was certainly special. It all made me feel very welcomed." Journalist question: If you had to price yourself, how much would you cost? Gareth Bale: "I don't think any player can do that to himself. That has nothing to do with the players. If a club wants to keep a player, they simply push the price up to sell him high. I'm not the right person to talk about that." Journalist question: What's your opinion on Cristiano Ronaldo? Gareth Bale: "Ronaldo is the best player in the World and he's one of the main reasons why I wanted to come to Real Madrid. This team is full of quality players and it will a honor to play alongside with him. I hope that together we can win many trophies." 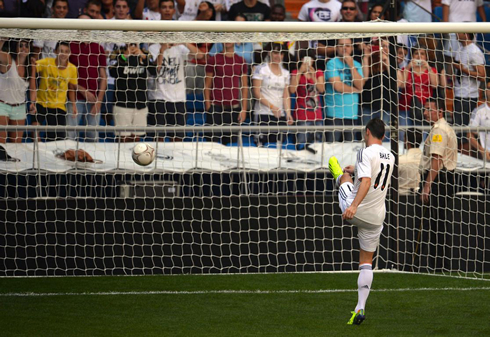 Journalist question: Ronaldo usually takes all the free-kicks in Real Madrid. Do you think you'll get the chance to take any? Gareth Bale: "Cristiano Ronaldo is the boss. He's the best player in the World and I just want to learn from him. My objective is to help the team winning titles. Therefore, we'll have to see what Ronaldo says about that... (smiles)"
Journalist question: Neymar has said during his own presentation that he has come to help Messi to keep being the best player in the World. You come to Madrid to help Cristiano Ronaldo too or do you aspire at being the best? Gareth Bale: "I don't think Ronaldo needs any help in that regard. He has already shown that he is indeed the best player in the World. There are some incredible players in this club... I hope we can win many trophies and that we may become a dominant force in the Spanish League." Journalist question: Where do you feel better on the pitch? On the left or on the right? Gareth Bale: "I like playing in all positions and wherever the coach orders me. I will do what Ancelotti tells me to do, as I don't know if I have any preference between any wing. I played on both the left and right just last season..."
Journalist question: You've been through some very complicated weeks before this deal has become official. What was your message for Tottenham fans? Gareth Bale: "Yes, but now I'm extremely happy here. It wasn't easy, but I think that Tottenham supporters will also understand the whole situation. I'm starting a new journey here in Real Madrid. This is my future and a dream come true. It was a relief to see everything settled on Sunday night!" Journalist question: Was it very harsh for you to say goodbye to Tottenham? Gareth Bale: "It has been difficult, because I had 6 great years in that club. Last year the coach [André Villas-Boas] has been terrific with me. I really hope they can get a Champions League spot this season." Journalist question: How do you find yourself now? Are you fit to play for the Wales National Team? 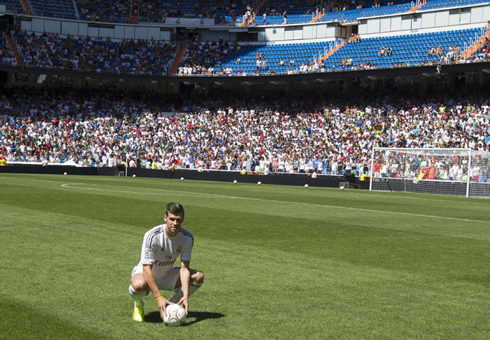 Gareth Bale: "I've been training I can't wait to play here. Let's see when I'm going to be called up. I've had a few problems but once I've heard Real Madrid was interested on me, I wanted to be in good shape. I will be at my best soon." Journalist question: Will you be ready to play against Villarreal in 10 days? Gareth Bale: "Yes, I'm in a good shape already. I've been taking care of myself on my own. My playing time so far is not great, but if I get called up to play for my country, I will help them out. I'll have a training program and I'll be back to my best form." Journalist question: Have you spoken with your new coach, Carlo Ancelotti? Gareth Bale: "Yes, I've spoken a few words with him already. We didn't go into much detail but it will be wonderful to be with him and improve my game every single day. I'll give my 100% every day. Ancelotti is a great coach! I had several talks with a lot of people that have worked under his orders and everyone told me he has been the best coach they've ever had in football. The squad is spectacular and I'm just another player who comes to help." Journalist question: You're taking the jersey #11, that used to belong to Gento, a player who won 6 European Cups for Real Madrid. Do you know the meaning of that jersey for the Madridismo? Gareth Bale: "Of course! Gento is a Real Madrid legend because he won 6 European Cups and that naturally brings some pressure on me. I hope I can help the club winning another European Cup [also known as UEFA Champions League nowadays]". Gareth Bale: "I've always knew that. Every player here are the best in the world at what they do. We know we'll have to work a lot to earn anything over here." Journalist question: Daniel Levy has lifted a lot barriers to slow down your transfer move. How did you deal with that? Gareth Bale: "It was hard. He's a very tough person and he wanted to make a good deal. Nevertheless, I'm thankful to him for having reached an agreement with Real Madrid, even though he has been quite inflexible during the whole deal." Journalist question: Is it true that Levy had promised that he would let you leave Tottenham if the club were to fail reaching the Champions League this season and a 80 million euros offer arrived? Gareth Bale: "That's part of the past. It was a private conversation and I don't think there's much to say about that." Journalist question: Is your dream to make history in the Champions League with Real Madrid? Gareth Bale: "Right from the start! The Champions League has been one of the most important reasons why I've decided to come here. Not only I want to play it, but I also want to win it. 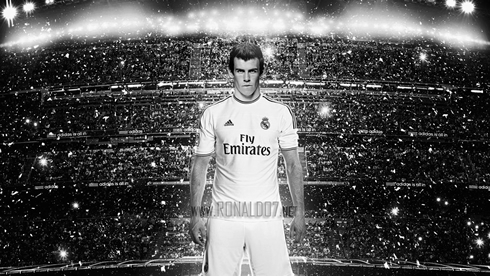 Real Madrid is the exact place where I want to be to win trophies." Journalist question: Luka Modric has been through a similar situation to yours last year. Did he give you any advice? Gareth Bale: "We're friends and we talk to each other quite often. He recommended to sign for Real Madrid. I'm now learning Spanish and I think it's important to keep learning it, as well as to know the Spanish culture. I'm sure he'll be able to help me and this is a challenge I can't wait to embrace. Without any doubts it will critical to learn Spanish, the culture and everything will be exciting for me. Who knows how this will impact on me and maybe make myself a much better person." Journalist question: Why did you start supporting Real Madrid when you were still a young boy? Gareth Bale: "I've always followed Spanish football closely and I think football here is marvellous. I've been watching it since I can remember. I'm thrilled to be here, in the best league in the World. The Real Madrid jersey I was wearing in the presentation picture goes back to when I was 9 or 10 years old. It's a dream for me to be here!" Journalist question: What's your first memory of Real Madrid? Gareth Bale: "I'm not sure about that. I remember that goal in the Champions League final when I was only 8 or 9 years old. I've always been a fan of this team playing style and I've always admired the results they've had. Kids look at a Real Madrid jersey and think to themselves: 'I wish I may wear this jersey someday'. And I've made that! I'm very happy." Journalist question: What about your idols? Gareth Bale: "If I had to pick only one, it would be Zinedine Zidane. But in this club's history there are also other great names I admire a lot , like Di Stéfano or Puskas." Journalist question: Is it true that Ryan Giggs has tried to convince you not to sign for Real Madrid, in order to join Manchester United? Gareth Bale: "No, that's not true. I've been in touch with him and did spoke several times. However, my mind has always been made for Real Madrid and that's where my heart is." Journalist question: How's your Spanish? Have you been practicing it? 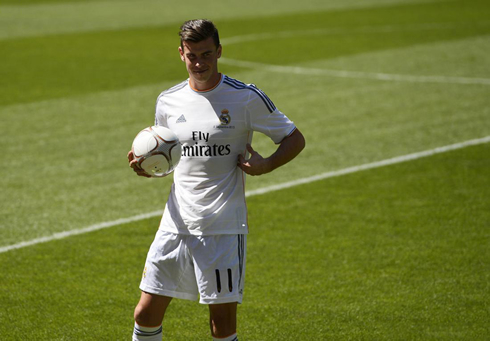 Gareth Bale: "Yes, I've been practicing, but I'm still not comfortable enough to speak it." Cristiano Ronaldo next game for Portugal will be for FIFA 2014 World Cup qualifiers against Northern Ireland, this next Friday (September 6, 2013) at the Windsor Park. You can watch Juventus live stream, Northern Ireland vs Portugal, Finland vs Spain, England vs Moldova and Germany vs Austria, all matches provided from our football live streaming section.